Gunung Agung, the volcano in Bali erupted on Saturday, November 25, 2017, 5:30 pm. Since the volcano erupted in Bali, Mount Agung, residents in the danger zone must evacuate to a safer place. Based on preliminary data compiled by Center for Operation Control (Pusdalops) BPBD Bali Province, the number of refugees up to Thursday 29 November 2017 reached 43,358 people spread in 229 point of refuge. Head of Information Data and Public Relations Information Center of the National Disaster Management Agency said the eruption of Mount Agung which followed the increase of status to the highest level requires the citizens in 22 villages around the mountain must be out of dangerous radius as far as 8 to 10 kilometers from the crater of the mountain. 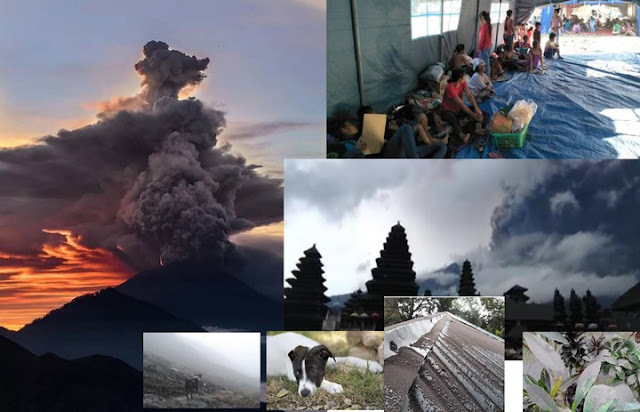 Since the residents have evacuated, the villages around Mount Agung in the danger zone now appear quiet. Along the way many leaves of deciduous plants, usually clean wind and passing vehicles. The grass and the weeds look yellowed and wilted. Likewise, many large trees are now leafless. Former traces of ash from rain are now not visible. Being washed away by the rain. Because of the last few days Bali has been raining non-stop. The highway near Mount Agung in Besakih village also looks deserted. Not only that, the cocoa farm belongs to the residents also looks dormant. Clove garden is also very quiet and without farmers activities. Usually the road to besakih, especially the road to Besakih Temple, is a very busy road. Because this road is to the most beautiful temple attraction in Bali. 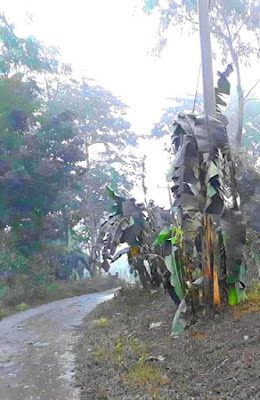 This road is also access to the spot climbing Mount Agung. Although the village looks deserted by the residents, several dogs roam along the road and inside the residents' homes. The dogs owned by residents left without a caretaker. Citizens prefer themselves and their families more than their dogs. The dogs must be starving and sad to be left behind by their owners. Very sad. In some villages still seen residents who took the time to evacuate the livestock. Most of their livestock are cows, goats, and buffalo. Residents carry their livestock as best they can. 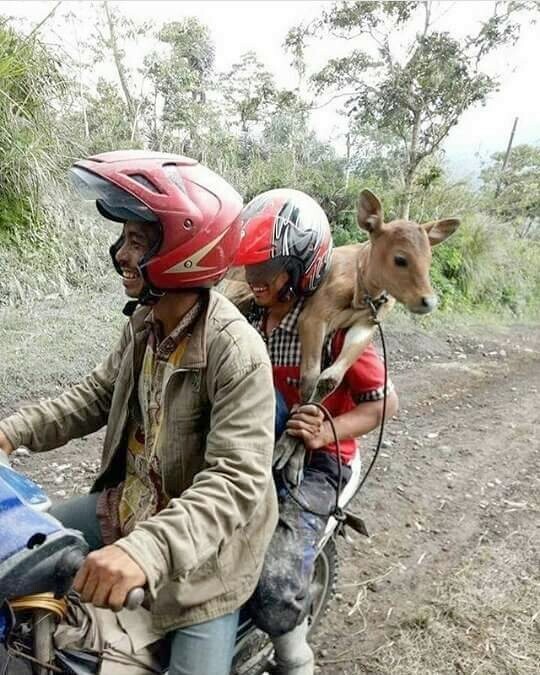 Small cattle they carry and carried on a motorcycle. Large cattle they carry with trucks. The cattle were brought to a safer place, in a neighboring village far from the danger zone. In Besakih Village some houses and shops look closed. There is no activity at all in this village near Besakih Temple. Although there are some people who are seen at home, it is a refugee who takes home utensils, such as mattresses, stoves and blankets. They are seen taking the necessary equipment at the evacuation site. Most of the residents around this volcano in Bali work as farmers. They mostly rely on the economy of cacao, clove, coffee, and various vegetables and fruits. Because the area around Gunung Agung is a very fertile but wet land, then the plantation is the most profitable commodity here, in addition to tourism. Now the agricultural land around this volcano has been damaged by ash. Ash showered the plants and threshed the leaves, resulting in many crops that failed to harvest. Rivers become polluted by cold lava floods. This cold lava flood contains sulfur that is not very good for plants, toxic. The negative impact of the volcano as it erupts is the disruption of the lives of residents around the mountain. For Bali, Mount Agung erupts a huge negative impact on the economy. Because most of Bali's economy is tourism. Of course people will not want to come to the island with a mountain that is erupting.